Instant download <1.5 MB. PC only. You have recognized the value of reciprocal linking for your website and have a page on your website with links to sites that you have exchanged links with. On an infrequent basis you check to see if your link is still present and frequently find that it is not. You then have to update your site and temporarily remove their link and let the manager of the other site know what needs to happen for their link to return. The process is time consuming and you probably avoid doing so. Unscrupulous website owners know this and sometimes only keep your link on their site for a few days. This can have a negative impact on your site's visibility. The Reciprocal Link Manager from Neuro Innovations automates this entire process via a combination of code running on your website (optional) and software that runs on your PC. You don't have to update anything or manually upload anything or check any of the reciprocal sites. The software manages the entire process for you. We use this software ourselves to manage the reciprocal links for all of the sites that we own or help manage. 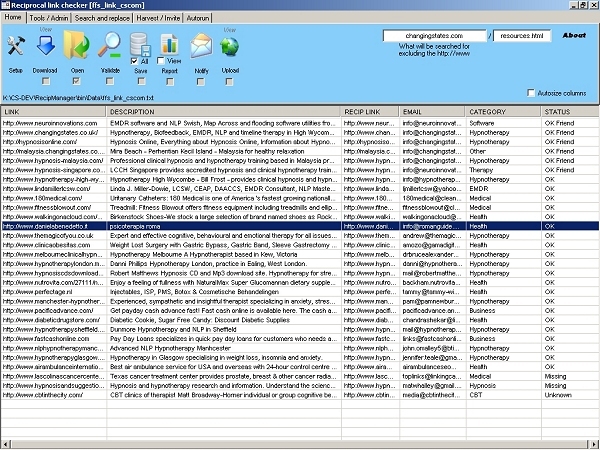 Reciprocal Link Manager can be used in a wide variety of ways eg a web form populates an online database that is then downloaded / validated / uploaded by this software OR more simply, link exchange requests are received by eMail and are processed manually (no download) and new records are added to the PC stored database manually and html output is uploaded manually. The software supports use with standard reciprocal linking programmes and 3 way linking programmes. To use the download / upload facilitiy you need ftp access to your site(s) and the ability to specify ftphost / data and html folders / ftp userid / ftp password via options, you will also need to able to read the ftp responses to determine if the upload / download was completed eg "File uploaded"
Apart from the above there are no other technical skill requirements as such. Complete novice computer users may experience a steep learning curve. If required we can help you to setup your site and can edit the template files so that output has the same style as your existing site. (Fees on request). What does the software do exactly? Batch ftp is used to download one or more data files from one or more web servers (there is a maximum of 95 files that can be specified). (You can add your own batch tasks to the process if required). You can then instruct the software to send our eMail notifications to those that have stopped linking to you. You can edit the eMail template used. Data files and html output files can be stored in different folders. If you wish a report can be generated detailing which sites have stopped linking to you for future reference. The software uses batch ftp to re-upload the data files and output files back up to your web servers. (You can add your own batch tasks to the process if required). If all is well the data is then added to the database and a thanks page is displayed. A backdoor admin password is provided to allow for most of the checks to not take place. You have the option to run the software in "hands free" mode. After downloading the databases there is no further required user input until the upload stage. You specify the databases to work with, what you would like to happen eg download / validate / export / upload and the software does the rest allowing you to do something else. The software does support use on XP/Vista/W7 Netbooks but we advise against it given the processing that the software undertakes. Clearly internet access is required. Not available on the Mac platform at the moment. This product is not part of the Therapists Toolkit but does count as a discount towards a Toolkit purchase.